Yesterday I posted a picture of a tree and hillside at Appleton Valley Farms. This is the same photo, but this time all dressed up for October 31st a woodcut effect and some dramatic lighting. Whether you are celebrating Halloween tonight (or Day or the Dead or Dia das Bruxas) or like some of us here north of Boston, just the fact that it will soon be possible to drive anywhere near Salem, MA, without encountering a traffic jam, I wish you happy times and safe travels. 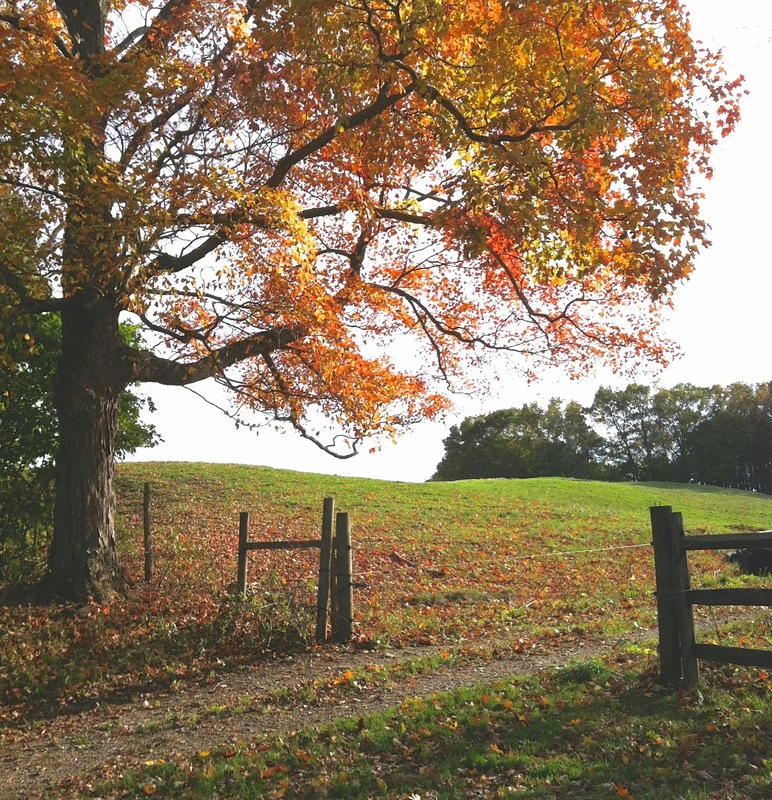 Here's another photo from last Sunday's trip to Appleton Farms in Ipswich, MA. I took a lot of pictures. I particularly liked this view of this beautiful tree near a hillside. Tonight I cropped the original photo to get this composition. I think this might be nice to paint. 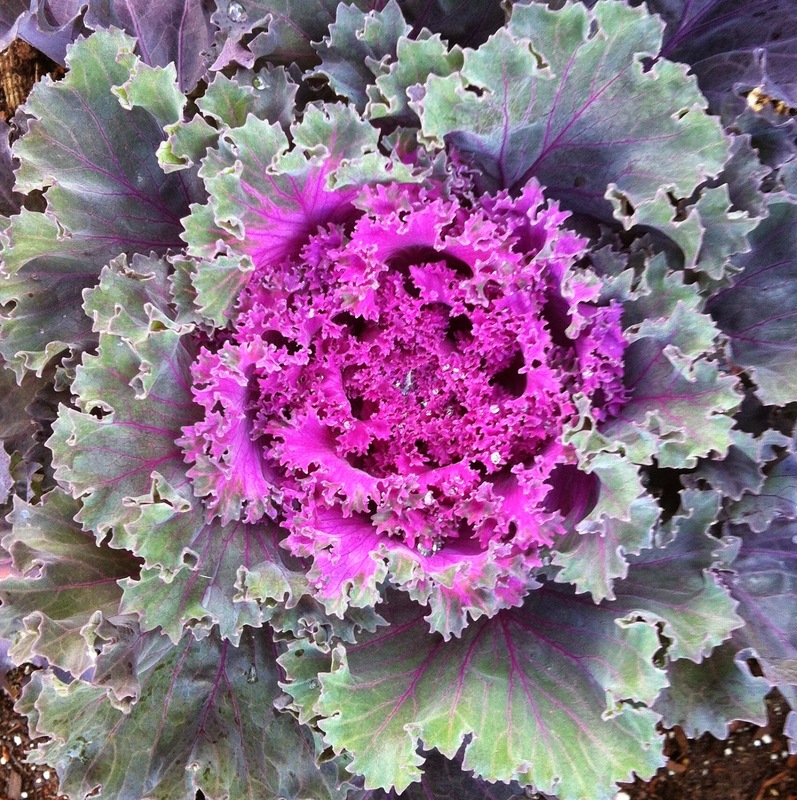 This is from Sunday's excursion to Appleton Farms in Ipswich, MA. It is very beautiful and I took a lot of pictures. One of my favorites is this tree-lined road. Tonight I cropped the original photo to get this image. Here is the painting I have been working on, a landscape painted from my imagination, but based on my memories of the Colorado Rocky Mountains. This is acrylic paint used as water media paint on paper (in this case 9 x 12 inches). This morning I added more green to the mountains, but made sure I kept some of that soft sage green that I think of as a Colorado color. I thought I was finished, but this afternoon I went back to the painting and made a few small changes, including one of the shapes in the sky that had been bothering me. Now I am willing to say that this is done. 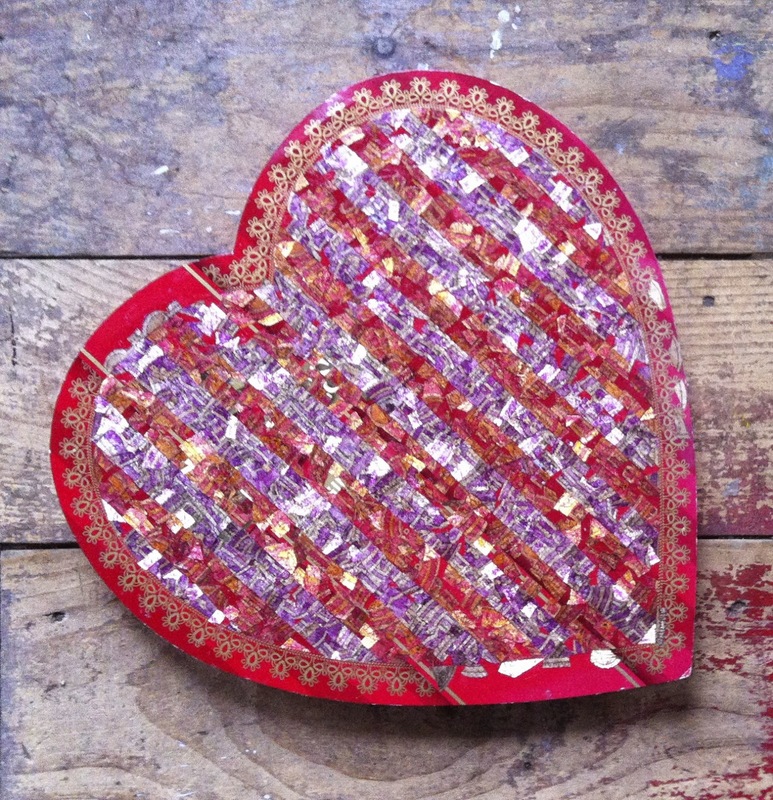 Here is the painting I have been working on. 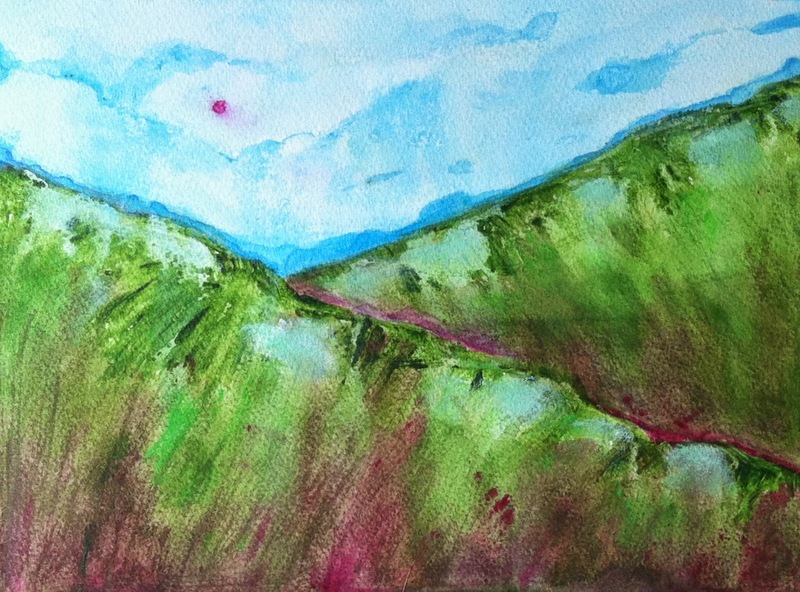 I am using acrylics as water media on paper to paint this small landscape. Although I am working from my imagination, I am drawing on memories of the Rocky Mountains of Colorado, where I grew up. This morning I worked on the sky, adding a few more shapes and a bit more color behind the mountains. I like the sky better, but now I think I want to see more color on the mountains. But it's almost there; maybe just one more day. Here is the small landscape I have been working on. This is acrylic used as water media, on paper. The mountain theme is inspired by memories of the Colorado Rocky Mountains in my home state, but I am working from my imagination. Today I put a green wash over the mountains and fixed a couple of lines. There are one or two details I still want to fix, but I hope to finish this tomorrow. This morning I worked on this painting again. 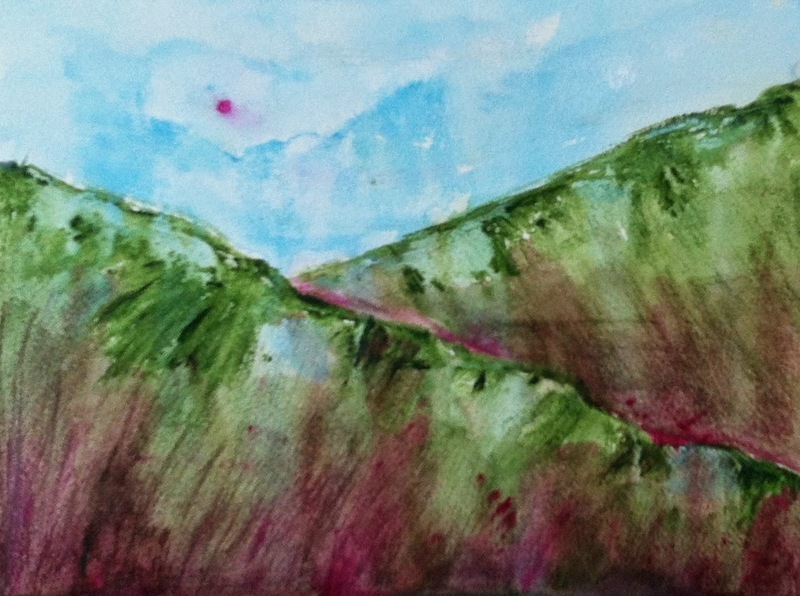 This is one of my paintings of the mountains, inspired by memories of the Rocky Mountains in Colorado, my home state. This is acrylic used as water media paint on paper (9 x 12 inches). Today I added green wash and added some violet red to the mix. I think this is almost done. This is a painting that I started today. It's small (9 x 12 inches), done with acrylic paint used as water media, on paper. 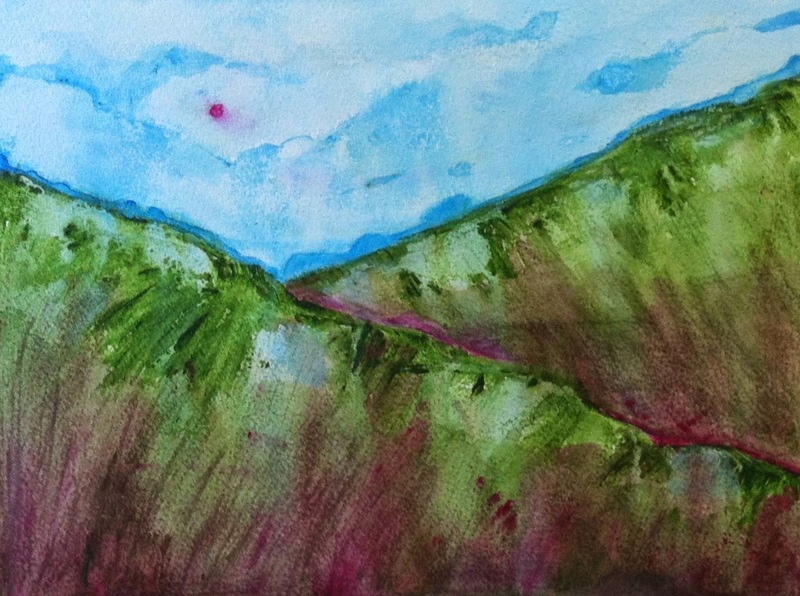 This is part of my "mountain daydreams" series, paintings from my imagination but inspired by memories of the Rocky Mountains in my home state of Colorado. When I posted last night's version of this little digital drawing, I said that it was finished, and I really thought it was. But later I realized that one of the most prominent blossoms had no stem attached and was just floating out there in space. So tonight I opened the image in Painter and fixed the problem with a little bit of line drawn with digital pastel. While I was at it, I checked the rest of the leaves and branches, and cleaned up a few more problems. At the last minute, I decide to crop the image at the bottom for better balance. I think that was a good decision. But now I am calling it. This is done. This is the little digital still life that I started over a week ago, sketching on my iPhone with the Brushes app. Since then, I have been using the Painter program on my computer to polish it up. 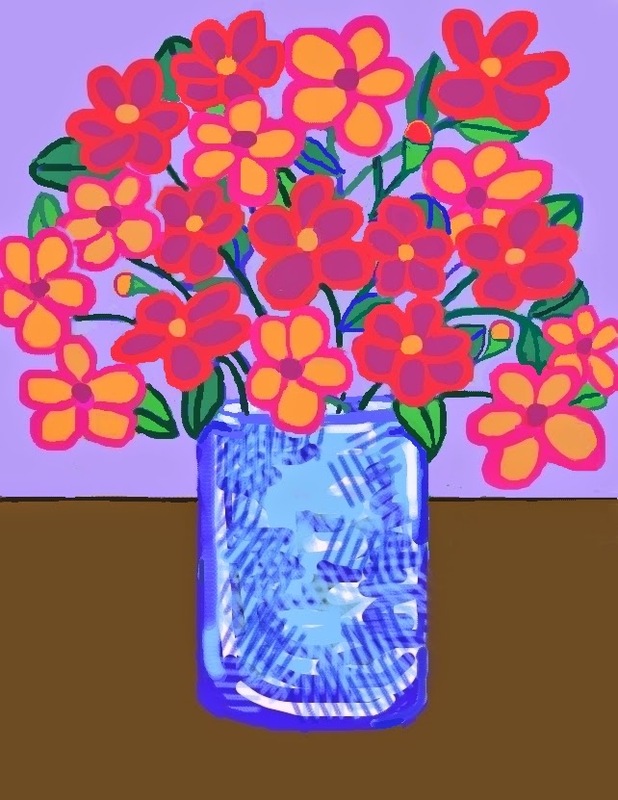 Tonight I made a few changes to the vase, added a little outline to the edge of the table, and cleaned up more leaves and blossoms. I am pretty happy with this little drawing now. (Maybe it will turn up in my store on Zazzle.) In any case, I am ready to say this is done. And it is time to move along. I hope to start painting tomorrow. I am almost finished with this little digital sketch. I started this still life several days ago, using the Brushes app on my cell phone, and for the past few days, have been using the Painter program on my computer to clean it up. Today I worked on the blossoms, changing some of the shapes and cleaning up some edges. Just a little bit more to go. . . . Here is my little digital drawing and it is still a work in progress. I started this on my iPhone, using the Brushes app. Then I transferred the jpeg into my computer and for the past few days, I have been using Painter to clean it up and finish it. Today I did a little work on the vase, trying to make it look like glass. Then I spent the rest of the time on the flowers, doing general cleanup. 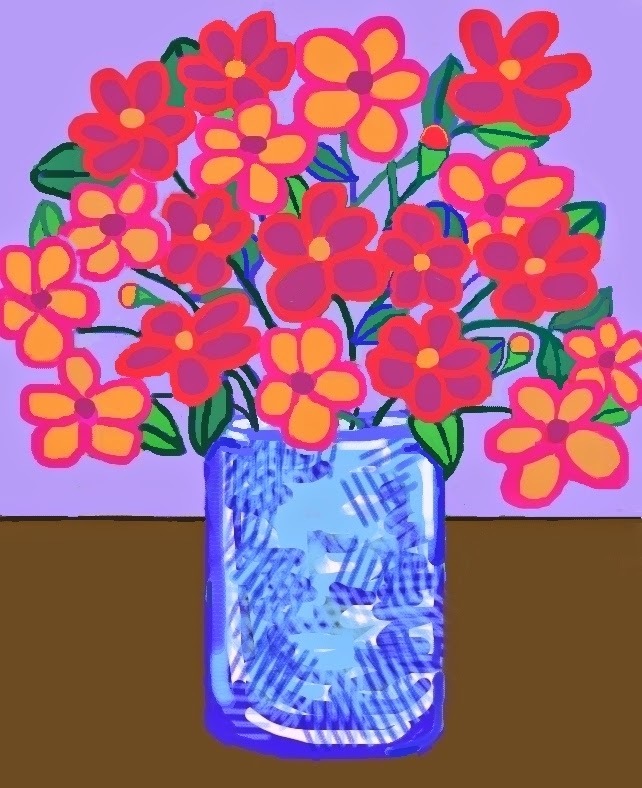 I used the background color to draw tiny lines of separation where the blossoms overlap. This is a lot of work for this funny little drawing, but I like it. There is just a little bit more to go and I hope to finish this tomorrow. 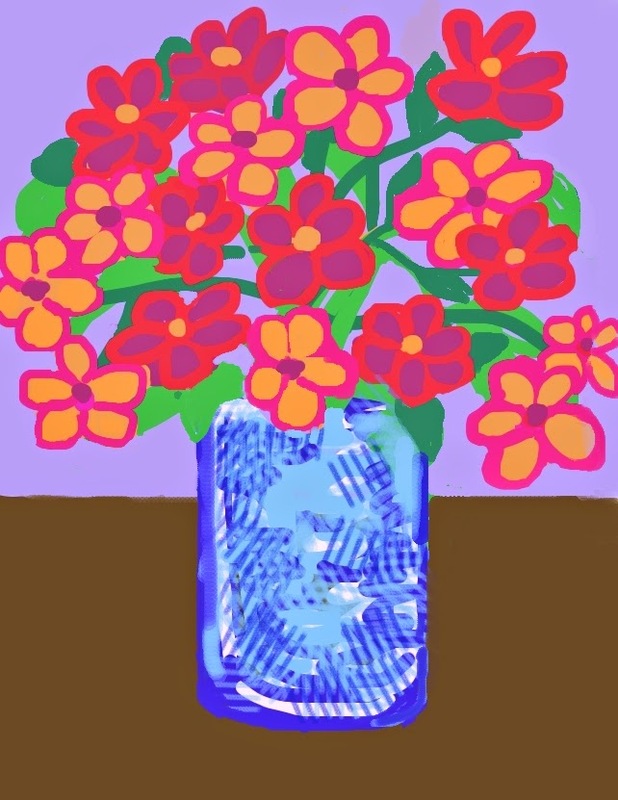 I started this little still life on my iPhone, using the Brushes app. Then I transferred it into my computer and for the last few days have been working on it in Painter. 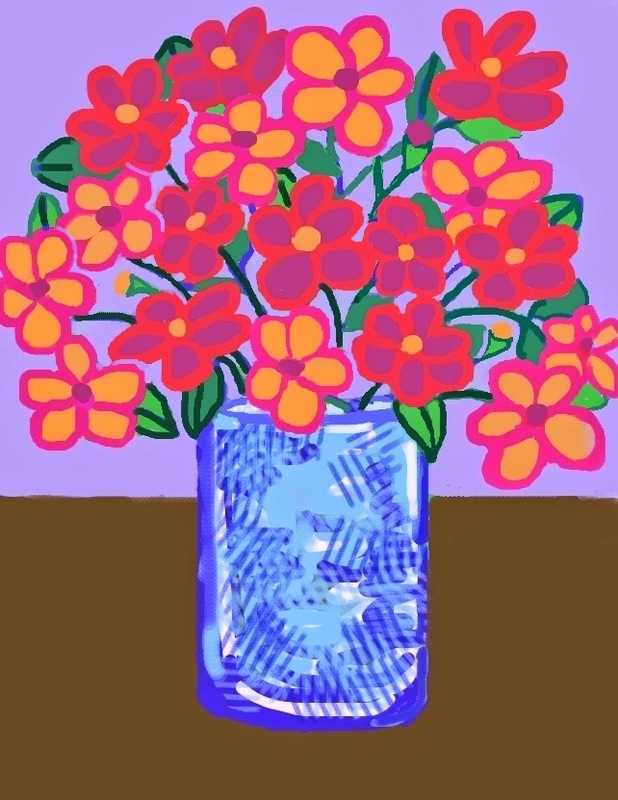 Today I worked on the top of the vase just a bit, and spent the rest of the time cleaning up the flowers. There is still a little bit more to do. Just because these flowers look kind of whimsical doesn't mean that I don't take them seriously. This little digital still life is still a work in progress. Today I spent some time working on with my Painter software. My focus was the stems and leaves. I used bright blue to draw in the revisions to show where each stem and leaf should be, and then I started going over my work with dark green. I also add three little buds to balance the composition. There is still a lot of cleanup to do, but I think this is going in the right direction. This little digital sketch is still a work in progress. I started this drawing on my iPhone with the Brushes app. Yesterday I transferred the image to my computer and this afternoon I opened it in Painter and started to clean it up. I put a grid over the image and could see that it was off center. 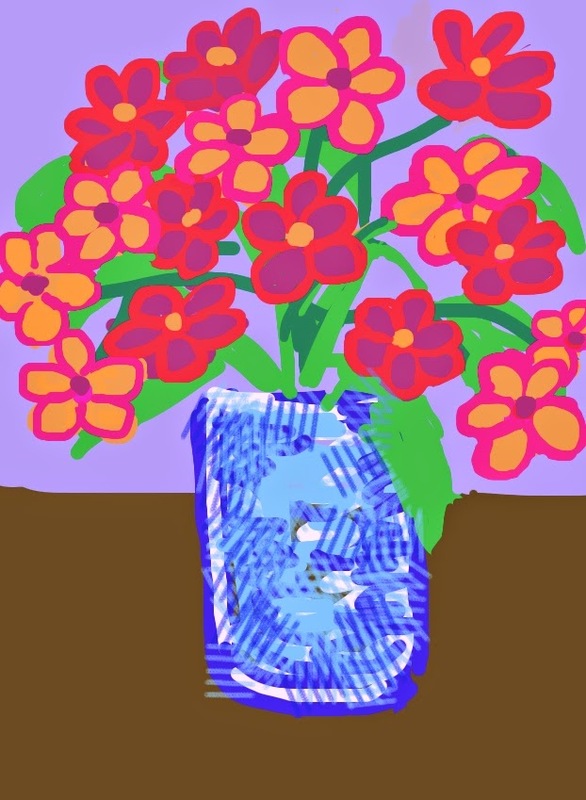 I straightened out some of the lines, and moved the vase over just a bit. It was still off center and I didn't want to crop the image, so I added some pixels to the right side and matched the background color. That did the trick. Then I added one blossom (cut and paste) and started to rework the leaves. I was just getting started, but I had to quit for the day. So I will keep going tomorrow. . . . This is a work in progress. I started this little sketch a few days ago, using the Brushes app on my iPhone. I have been working on it a little bit at a time and I like how it is going. Now it is ready for some clean-up, so I transferred it into my computer so I can continue working on it in Painter. To be continued. . . . Here's another in my little fall harvest series. 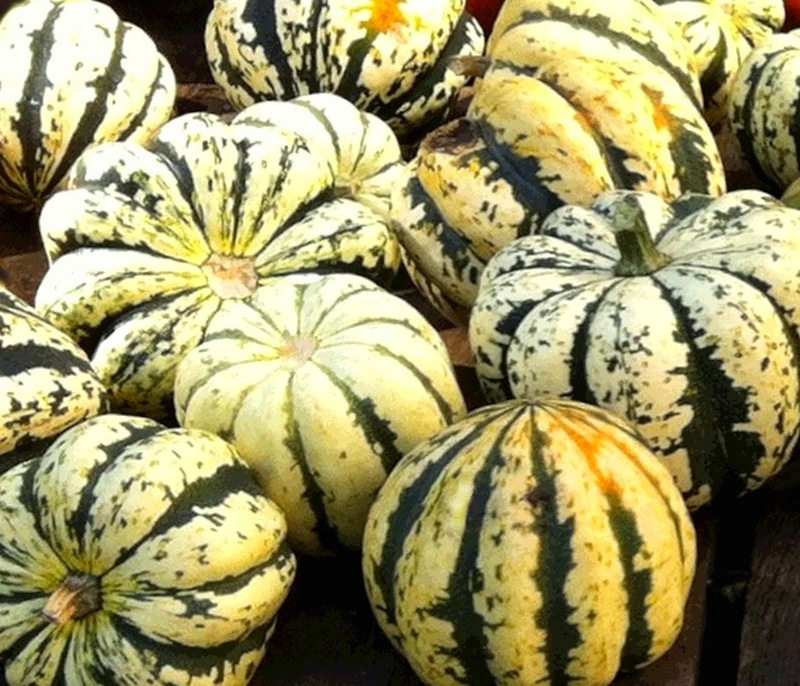 These are miniature tiger striped pumpkins. The image began with a photo that I took at Trader Joe's last week. 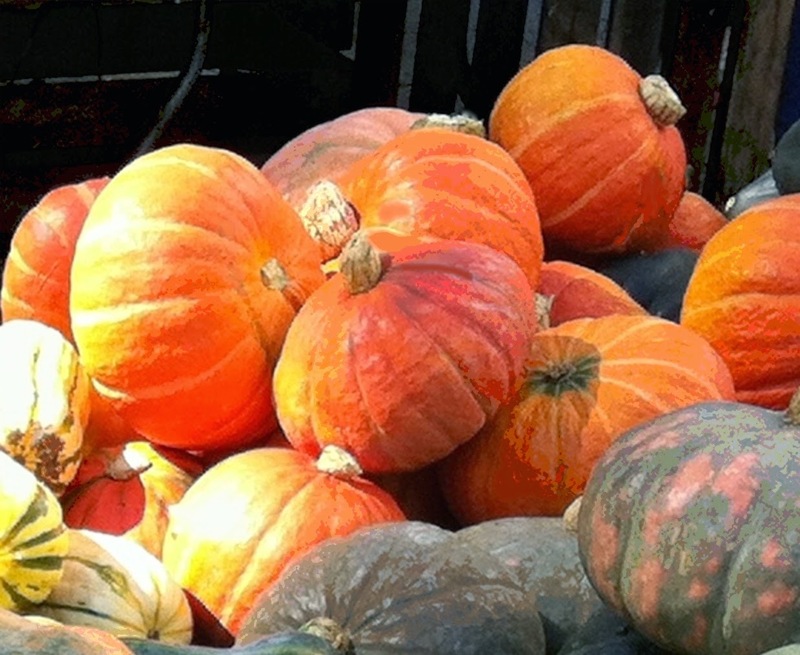 Tonight I used Painter's digital airbrush to clean up the pumpkins, and then cropped the photo to get this composition. Here's another photo from my recent trip to New York City. I walked through the Farmer's Market and took a lot of pictures. I saw a table full of peppers and tomatoes. The peppers were standing upright in little baskets and it looked like a parade. It made me smile so I took pictures. I cropped this image out of one of the photos. Here's another image that started with a photo that I took at the Farmer's Market in Union Square during my recent visit to New York City. 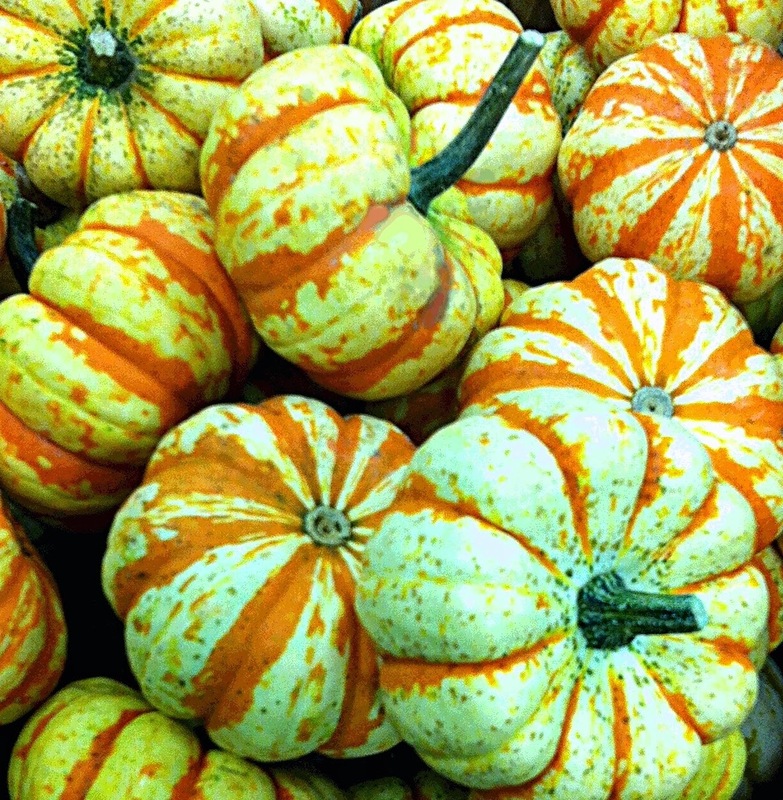 This still life includes pumpkin, delicata squash, and kabocha (green pumpkin). All are edible, but also fun to use for decorations for fall holidays. Today I cropped this out of a larger photo, so I used Painter to enlarge the image. Then I did some cleanup with digital airbrush and used color overlay and selective posterizing to get this image. And I managed to keep what I liked best about the original: the combination of bright sunlight and dark background (which was the booth set up for the market). Here's another image that began with a photo that I took a few weeks ago at the Union Square Farmer's Market in New York City. 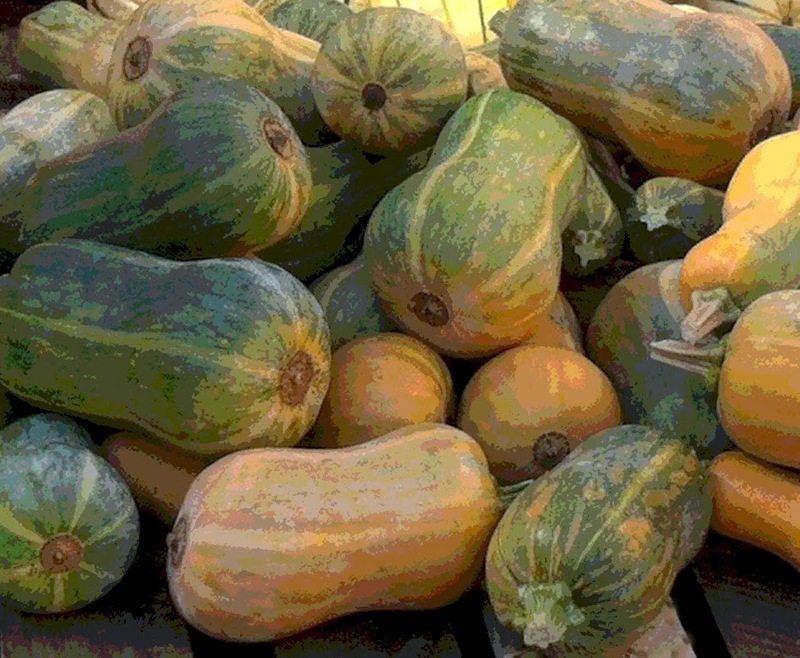 Tonight I used Painter to clean up the squash, and then I added a posterized effect and cropped the photo to get this composition. During my recent trip to New York City, my cousin took me to Union Square and we walked through the Farmer's Market. (I know these are Sweet Dumpling Squash because the sign said so.) I liked the patterns and colors, so I took a picture. This afternoon I used Painter to clean up the image with digital airbrush. Then I posterized the image and cropped it to get this composition. photo shoot. The original version of this photo was backlit by the afternoon sun. That created some issues with the lighting, but some of the problems are interesting and might even be usable if I can figure out what to do with them. (Still thinking about that.) Meanwhile, I cropped this image out of the original photo and cleaned it up a bit. I like the colors and the way the dappled light hits the leaves. 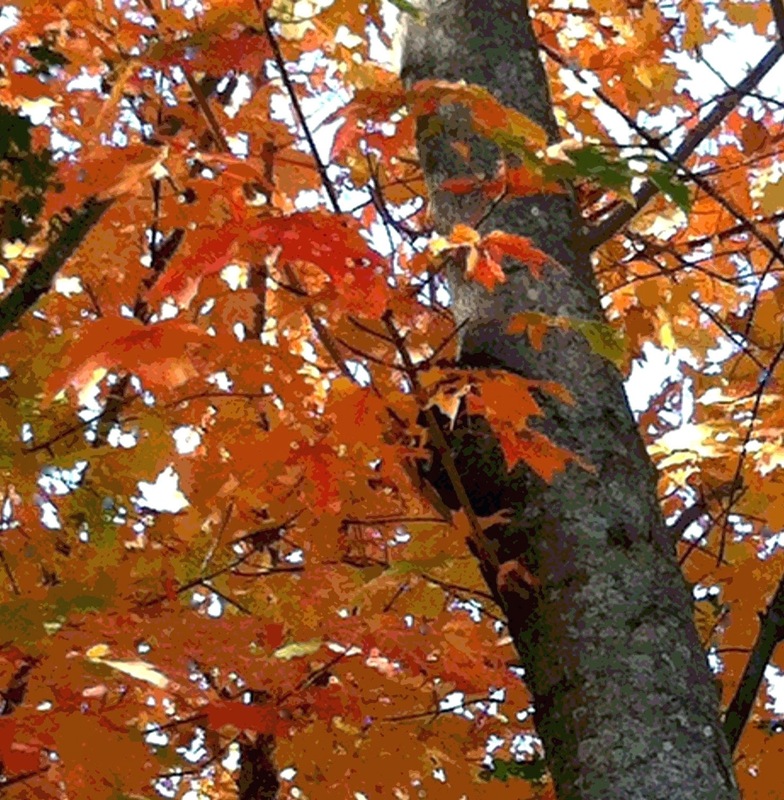 This image also started with my little neighborhood leaf-peeping excursion of last weekend. This beautiful maple is just down the block. 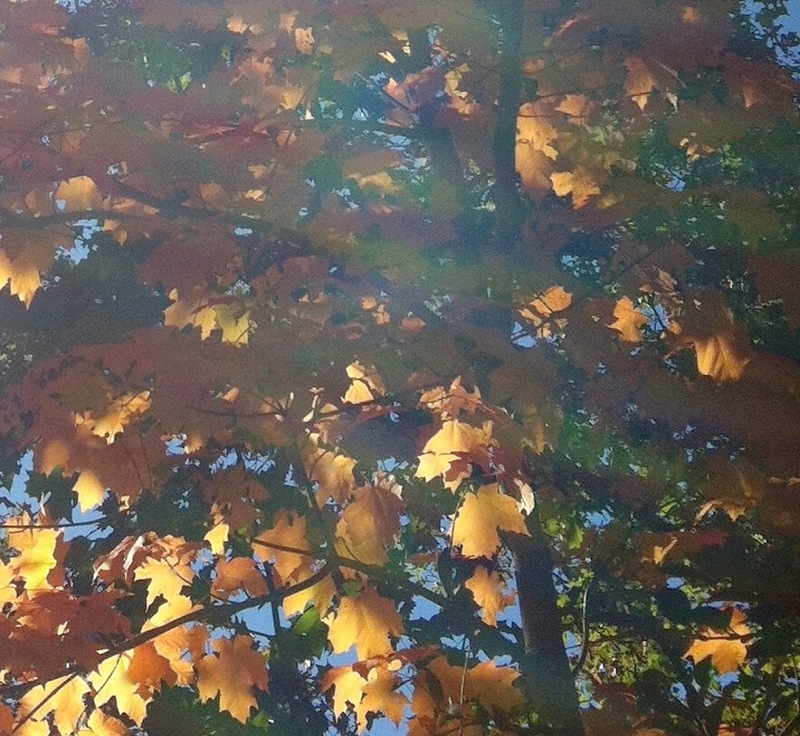 I love the way autumn leaves look against blue sky. (Why does blue sky look more intense in the fall? Is the color contrast with the leaves, or just the dryer air?) Anyway, while I was taking the my photo, I was aware that I was also photographing to big electric lines in the background. Tonight I used Painter's digital pastel to get rid of them, so they don't show in this version. Then I posterized the image and cropped it to get this composition. Here's another image that began with my recent neighborhood photo shoot. 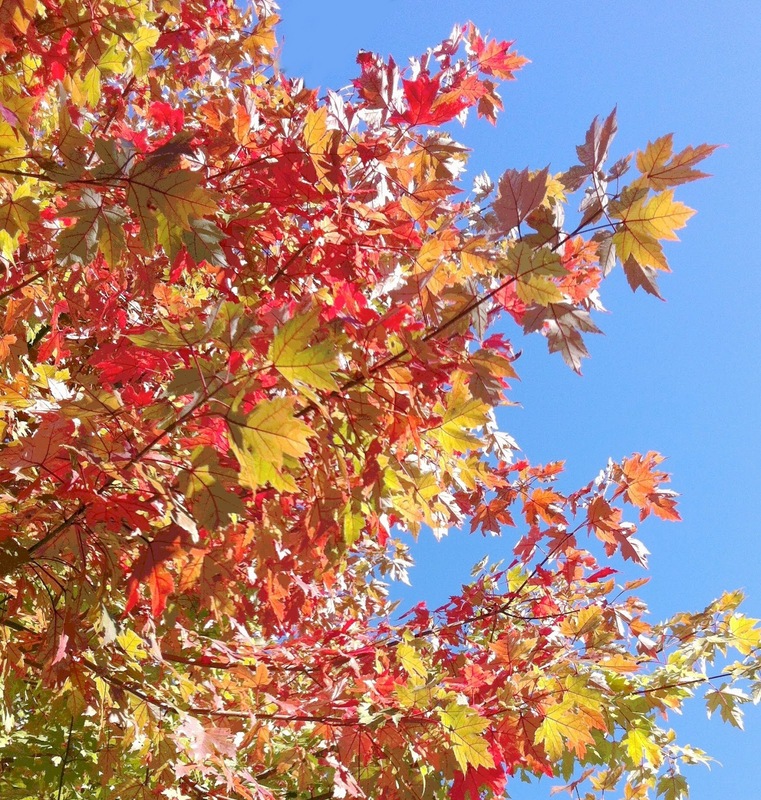 This is one of the beautiful bright maple trees just down the street. Today I cropped this image out of the original photograph, and posterized it using Painter. Another photo from yesterday's neighborhood photo shoot. 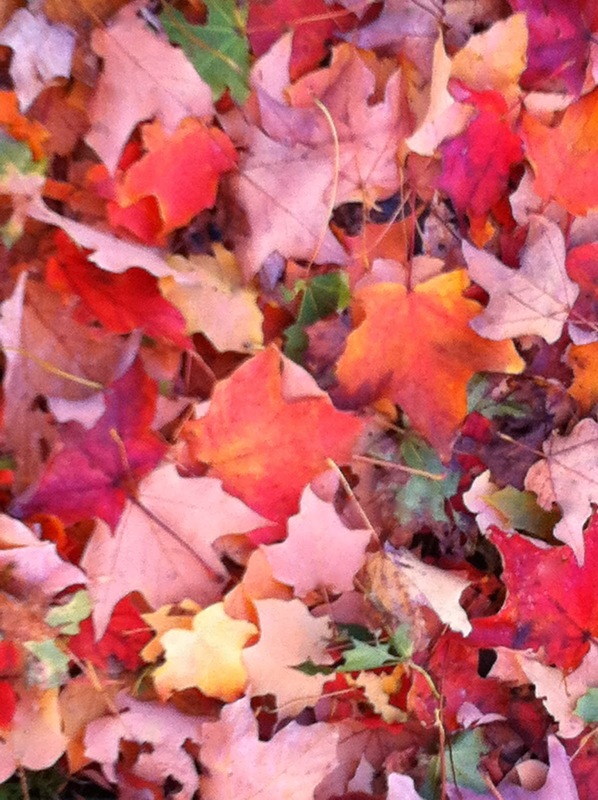 Sometimes the best way to see autumn leaves is to look down. A lot of people come from far away to visit Massachusetts and drive through the state to see the fall colors. But all I have to do is walk around the block. 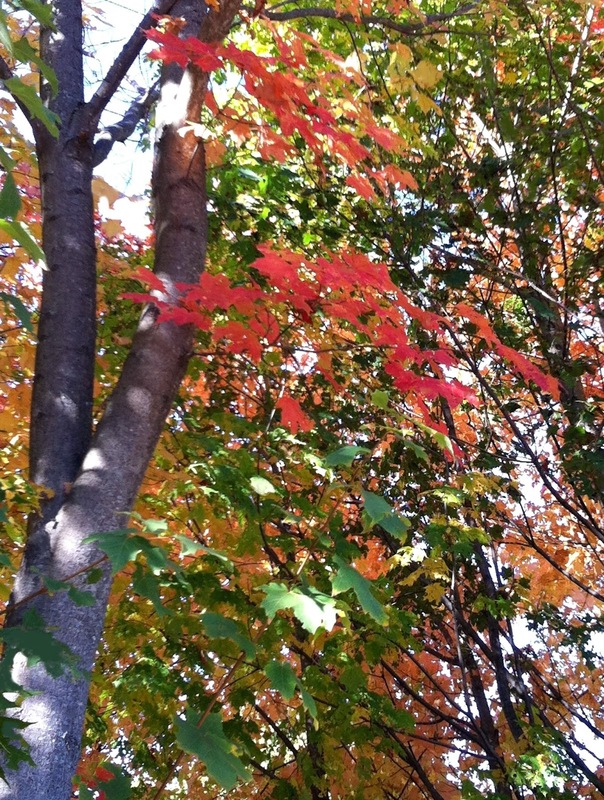 I love red leaves and they have arrived earlier than usual this year, probably due to cool overnight temperatures. Recently I have been admiring some beautiful trees that I see as I drive home from the grocery store, and I have been tempted to stop the car and take pictures, but it always seems impractical. There is always a car right behind me, I am usually in a hurry, and besides, this is one block away from my house. But today after I got home, I took a walk instead, and took 30 pictures of some beautiful leaves just a block away from home. This is one of the best of pictures, but I got the photo into the computer, I could see that some of the leaves were torn, so I did a little bit of repair with Painter's digital pastel. Then I did a little light posterizing and cropped the image to get this composition. This image began with a photo that I took during my recent and very short trip to New York. My cousin was showing me the High Line, a elevated railway line turned into a linear park and nature trail. 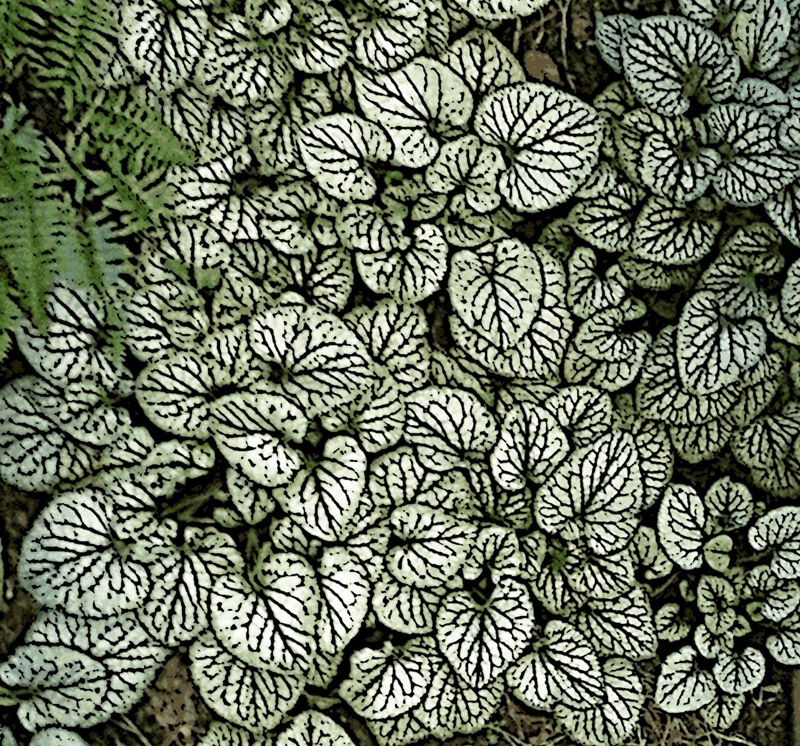 We were walking two stories above the street, and I looked down onto another garden below and saw some white caladium. I loved the pattern, so I took a picture. The original photo had an uneven focus for some reason (probably because when I get excited or enthusiastic, I am likely to make mistakes). So I opened the image in Painter and adjusted the focus. Then I cropped the image and added this woodcut effect. This image began as a negative that I found last May when I was rummaging among family photos, looking for something else. I sure recognized the people, and wanted to see more. I didn't have a print, so I scanned the negative into the computer and then used Painter software to create a positive image. It was a great picture of my parents dancing at a wedding. The photo was taken by my Uncle Ike (Isaac Fitterman), who was a professional photographer. The negative was in an envelope labeled "Ruth & Hy" and identifies the event as a wedding in June of 1954. Tonight I went back to the rescued photograph and opened it in Painter again. I cropped the original image and then used some cut-and-paste to get rid of a distraction in the foreground (a taffeta skirt worn by another wedding guest). 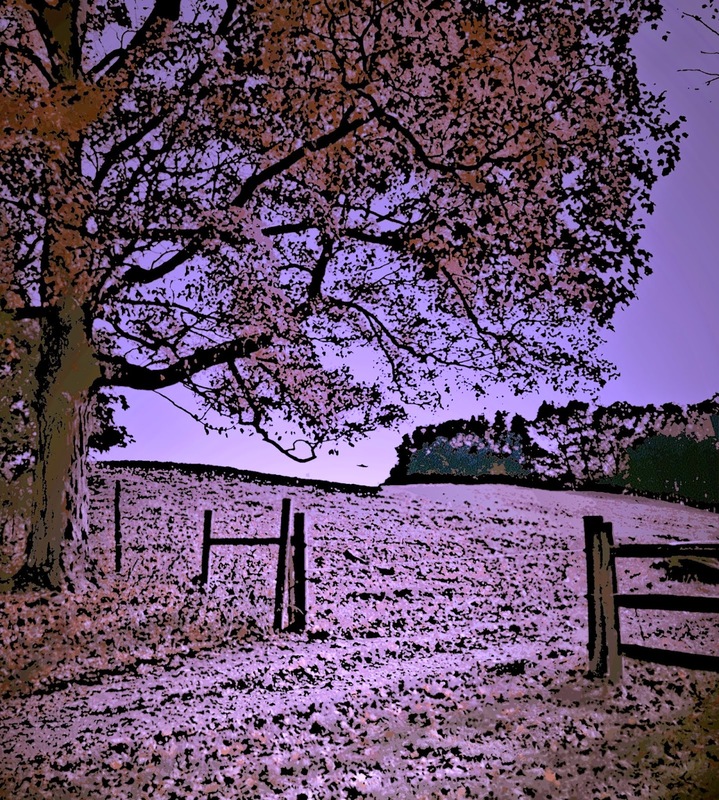 Then I used a combination of digital pastel and color overlay to add color, and posterized the image section by section. 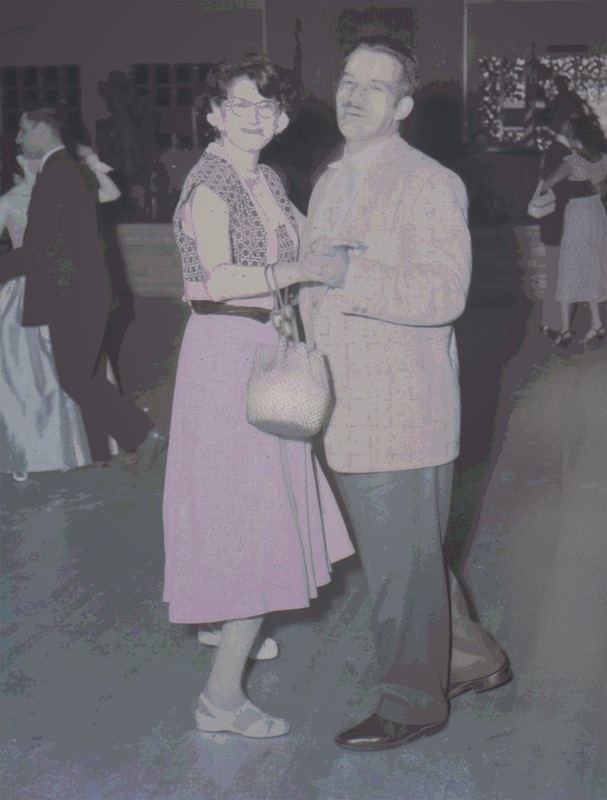 It was fun to invent the colors and to think about my parents on the dance floor. I am grateful to have this image because this is how they looked when I was a child. So my negative turned into a positive image. And a memory turns into a blessing. The other day, I was out in the rain with our little dog. She seemed to be ignoring the practical purpose of our excursion in favor of sniffing the blossoms on each and every chrysanthemum plant along the sidewalk in front of the apartment building. She reminded me to stop worrying about the rain and pay attention to the flowers, so I took out my iPhone and took some pictures. It was a very cloudy day and I could see right away that the colors in the photo weren't accurate. Tonight I used iPhoto to adjust the color balance, and then cropped the photo to get this composition. If you look closely, you can see the raindrops on the petals.